Of all the composers who have approached the Broadway musical, a very, very few compete on the same level as Leonard Bernstein, even just musically. In many ways his best, “West Side Story,” with its modernized Romeo and Juliet, lyrics by a then-young Stephen Sondheim, direction and choreography by Jerome Robbins, ushered in a new form of the entire genre. Beautiful but raw, its tale of prejudice, abusive law enforcement, angry youth and cultural disconnects resonates across the years like few other pieces have. A good “West Side Story” can capture all that raw energy in ways which entertain, touch and impassion. To be good, it must have solid dancers, singers able to handle the complex rhythms and soaring notes of the Bernstein score, and youth. This, with a few notable exceptions, is a young person’s story. Now at the Candlelight Pavilion Dinner Theater in Claremont, virtually all of the necessary elements are there. The result is a most satisfying evening of beautiful music, touching story and amazing energy. The tale is literally classic. Two rival gangs vie for control of a beaten down New York City neighborhood. One group, composed of down-and-out whites, many the children of European immigrants, calls itself the Jets. The other, the Puerto Rican gang known as the Sharks, is seen as having moved in on Jet territory, while for the Sharks this is simply the neighborhood into which they have landed. Contact – often violent – is common, and except for neutral zones like the school gym where dances take place, the two groups carefully maintain a separation. That is until Jet founder Tony meets Maria, the sister of the leader of the Sharks. As battle lines form, their love becomes more hidden, more real, and more potentially tragic. If looking for a reason why the Candlelight Pavilion production works so well, one need look no further than Ayme Olivo’s absolutely charming Maria. Gifted with a lovely, well-trained voice, she epitomizes the innocence and romance of her character, growing with her as the plot deepens. As her brother, Bernardo, Juan Caballer vibrates with pride and intensity, Michael Gonzalez makes a manlier-than-sometimes Chino, while Celeste Lanuza’s Anita carries herself with an air of very feminine command, dances with expertise, and makes “America” the highlight it can be. Although Jarred Barnard is so pacific as Tony that it seems unlikely he’d have ever been in a gang, Chaz Feuerstine makes Jet leader Riff a true believer. Joined by the rest of the Jets, most especially Josh Switzer’s barely contained Action and Lacey Beegun’s convincingly tough tomboy Anybodys, they prove a formidable counterbalance to the tense Sharks. Also a standout is Jamie Snyder as the drugstore owner, Doc, for whom Tony works – a man torn by the violence around him and the loss of young potential. Director Hector Guerrero makes the piece work, keeping the pace quick with the help of Mitch Gill’s amazing puzzle-box set design. Guerrero has, in large part, recreated the original Jerome Robbins choreography as well, only in small – something elemental to the personality of the show. Douglas Austin’s work as musical director deserves special kudos, as his cast sings the excruciatingly difficult pre-rumble quintet, without a visible conductor, as if it was a piece of cake. Indeed, one is left without much to criticize music-wise except for the inexplicable cutting of the overture, which along with Bernstein’s overture to “Candide”, stands among the most outstanding pieces of orchestral Broadway music ever written. It also serves to lay the ground for the intensity to follow. Still, this colorful and tuneful musical makes for a delightful if touching evening. If you’ve never seen a live performance of this work, you’re in for a treat. If it’s an old friend to you, as it is to me (as it was the first show I ever worked on, way back in high school), go and reacquaint yourself with an old friend. If it has nothing new to teach, it still has a ring of universality which travels across time. One of the most celebrated Broadway musicals of the recent past is Mel Brooks’ adaptation of his film “The Producers.” Ridiculous, clever and continuously engaging, it still demands a strong cast and a strong directorial vision to be a success. What a delightful surprise, then, to discover all of this at a place where you can also get a decent meal: the area’s last remaining true dinner theater, The Candlelight Pavilion in Claremont. The story is as silly as one expects from Mel Brooks. Max Bialystock, a failing Broadway producer, joins forces with a timid accountant named Leo Bloom to make money by fleecing investors in a show intentionally so bad it closes. As Max gathers the money from a fleet of aged women he sequentially seduces, the two begin their search for a truly awful musical they can contract for, and cast. They hire a famously awful director, with his crew of stereotypical assistants, and the plot thickens. Director Brian Thomas Barnhart and choreographer Janet Renslow work with considerable success to recreate the Broadway original on Candlelight’s smaller stage. A sizable, talented cast lives up to these demands, led by Jamie Snyder’s appropriately over-the-top Max, and Bobby Collins’ humorously fragile Leo. Both have strong singing voices, as well, and the entire cast proves impressive in dance routine after routine (including the famous “tapping walkers”). The polish doesn’t end there. James Gruessing’s set is a star all in and of itself – one of the most complex and layered ones Candlelight has ever used. The lighting is great, and the costumes, from The Theatre Company, are just right throughout. More importantly, one laughs and laughs often. The show is genuinely funny, frankly funnier than in the production at the Ahmanson, where Jason Alexander, rather than living into the part of Max with great glee, seemed apologetic for not being Nathan Lane. No apologies here. Everyone is playing their parts full-out and the results are absolutely delightful. One warning: Mel Brooks loves making fun of lust, and as such there are a number of moderately off-color references and actions which may make this a show that is inappropriate for kids. On the other hand, the show comes accompanied by good food and fabulous desserts, all of which contribute to a generally joyous experience. 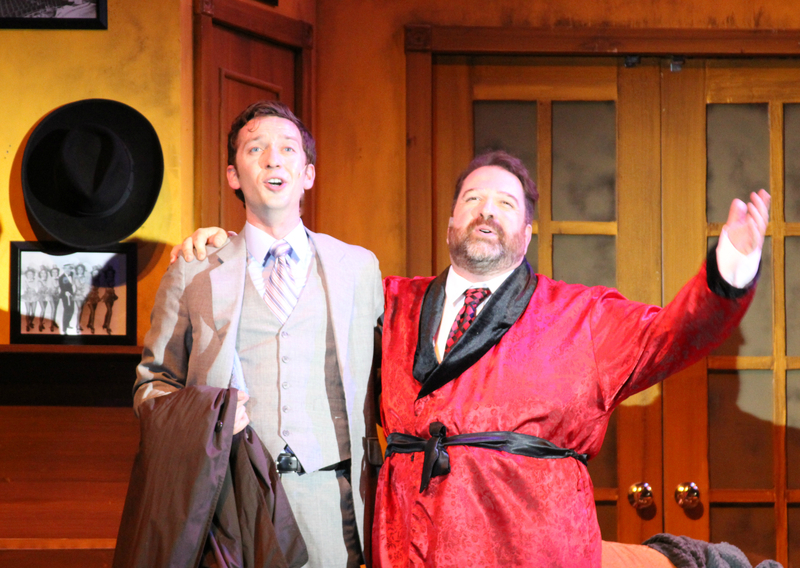 So, go see “The Producers.” Having seen many of the productions in Candlelight Pavilion’s 30-year history, I’d rate this among the top ten. It really is worth one’s while to go and enjoy.